A rare second Full Moon of the month, known as a "Blue Moon", is seen over Cincinnati on Friday, Aug. 31, 2012. 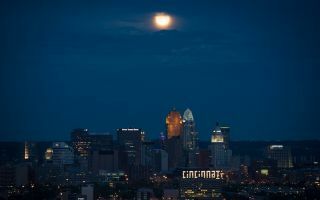 A rare second Full Moon of the month, known as a "Blue Moon", is seen over Cincinnati on Friday, Aug. 31, 2012 in this amazing space wallpaper. The family of Apollo 11 Astronaut Neil Armstrong held a memorial service celebrating the his life earlier in the day in Cincinnati. Armstrong, the first man to walk on the moon during the 1969 Apollo 11 mission, died Saturday, Aug. 25. He was 82.